“Before you vote, check his voting record on LGBT rights and women’s right to choose. It may surprise you. 1) Never voted on Equal Gay Rights. 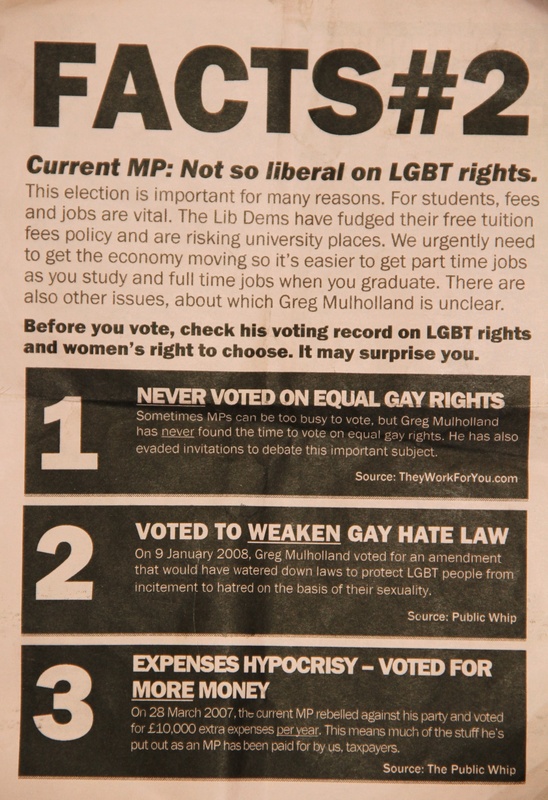 Sometimes MPs can be too busy to vote, but Greg Mulholland has never found the time to vote on equal gay rights. He has also evaded invitations to debate this important subject. He has written a letter to the leader of the Opposition, David Cameron asking him for assurance that “anti Christian campaigning will never be repeated in Leeds North West or anywhere else”. “It also claims I ‘voted to weaken gay hate law’ when the amendment I voted for, as you will remember, was tabled by a cross party group of MPs, including Conservative MPs, who were concerned that the legislation as drafted could lead to the prosecution of Christian preachers. Mr Mulholland has the support of the local Anglican Bishop John Parker and has also written to Bishop Arthur Roche of Leeds asking for his support. But as voting time is ticking with the election happening tomorrow, the question to ask is: Have American-style culture wars hit British politics?